This is my first post as a Daring Cook! I was so excited to finally be able to join the Daring Kitchen now that I have a blog. Hilariously enough, I'd never done a braise before this, so it was educational and delicious! I wasn't quite sure what to do at first, but in the end Loblaws decided for me. Chicken thighs were on sale at the same time as Ragu tomato sauce. How could I resist? This recipe is probably as simple as a braise can get. The braise itself only takes about 45 minutes, but man does it taste good. 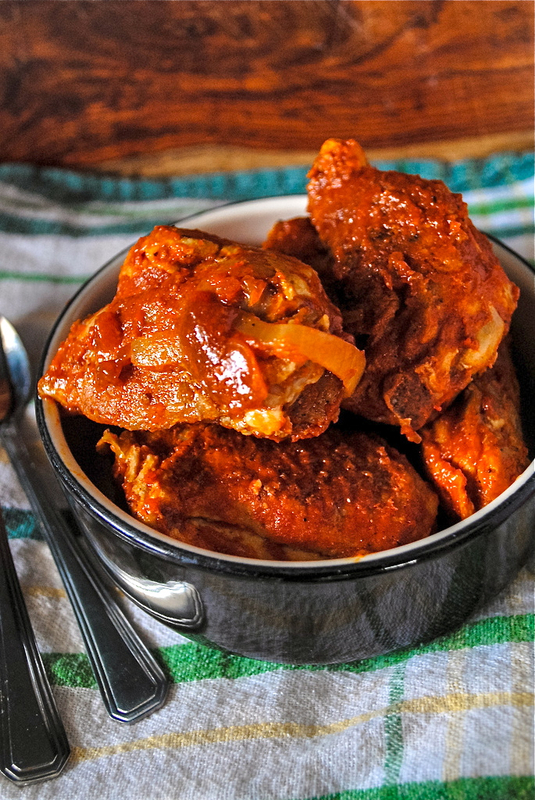 The chicken just oozes its goodness into the sauce and the sauce evolves into something epic. Man I'm being poetic, but as you can see, it surprised me how good it tasted! And, sure enough, it got better with age. This recipe is perfect for those who don't like fussy recipes with a lot of ingredients or steps involved. The recipe I'm giving you is a great starting point for epic personalization. Potatoes would be a great addition to this and can be cut into cubes and added with the tomato sauce. Carrots would be great too, but go even further with the root vegetables! Add parsnips or rutabaga. I used BBQ spice, but really any set of spices and herbs would work great. Also, feel free to make your own tomato sauce, but as I said above, if you don't have the time nor energy, a good store-bought tomato sauce can be just as good. I served it with brown rice one day, then ladled it onto pasta another. Any starch would work great. Foccacia (or any bread) would be the best, I think, because you'll want to sop up all that awesome sauce! Heat the canola oil in a large skillet over high heat. Season the chicken with salt and pepper on both sides. When the pan is hot, add the chicken skin side down. Work in batches if they don't all fit and make sure not to overcrowd the pan. Sear the chicken on both sides until a nice golden brown, about 3 to 5 minutes per side. When all the chicken is browned, set them aside on a tray. In the same skillet, add the onions, chili pepper, ginger and garlic. Saute until the onions become translucent, about 5 minutes. Add BBQ seasoning and season with salt, to taste. Return the chicken to the pan. Add tomato sauce and potatoes and stir. Turn down the heat low, cover (leaving a bit of room to let steam out) and simmer until the chicken is cooked through, 30 to 45 minutes. When the chicken is cooked through, taste for seasoning and serve over pasta or rice, or with bread or foccacia. Great job!! This is such a simple recipe, but you are right, somehow magic happens inside that pot and jarred pasta sauce turns into awesome-sauce! :) Welcome to the Daring Cooks! I know! It surprised me even though I probably should've been expecting it, haha. And thank you! I'm so excited to be a member!! Isn't the rendering of the fat from thighs so high that you get a layer atop the gravy? I didn't, actually. A lot of the fat came off when I seared the thighs. However, if you do get a lot of fat, you can skim it off during the simmer time. Love the addition of BBQ suace with the tomato sauce...makes it more flavorful! Thanks for sharing! Good eye! I must have missed it. About 1 tbsp of fresh or frozen ginger. Thank you! © 2011 Phenomenom. Simple theme. Powered by Blogger.